I’m working on a post for my new clear gummy recipe and the recipe template program I use has a pull-down menu for units that doesn’t include “envelope” (it has “packet” but that means different things to different people). I measure Knox unflavoured gelatin for the gummy by the envelope (you can use store brand, but I’ve found Knox to have better clarity, and I buy it in large packs from Amazon). But that website is kind of old, and the Kraft version of the website doesn’t state the amount per envelope at all (other than if you do the math that an 8 oz box of 32 envelopes means 0.25 oz per envelope, which is about 7g). Thus, being the skeptic-minded person I am, I went and measured. I emptied an envelope into one of my little shot-glass measuring cups, then tapped and spun it gently to get a level surface. I had some trouble getting good photos, but as you can see, there’s no way that’s 2 1/2 tsp. It’s not even 2. 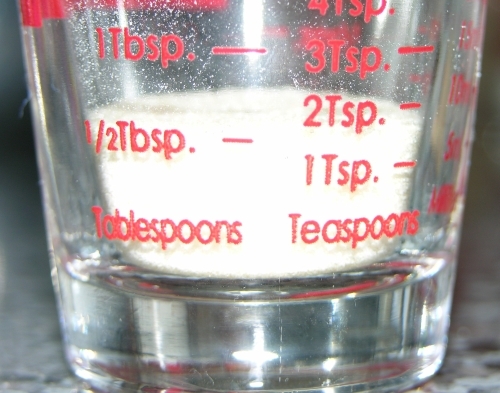 This photo taken with a flash shows that it's slightly over 1 1/2 tablespoons but a bit under 2 teaspoons. This photo without a flash makes it look closer to 1 1/2 tablespoons but the top layer is glowing a bit. Having seen it with the naked eye, I’d call it a bit under 2 tsp. I then measured it by weight on our digital scale, pouring it from the shot glass into a little glass dish that I’d tared out to zero first. It flickered between 5g and 6g at first until it settled on 6g. Just to be thorough, I got a fresh envelope and weighed that: 8g (but that includes the paper). Then I tared the shot glass, and poured the fresh envelope into that. That flickered between 6g and 7g. It is possible that enough stuck inside the shot glass when I poured it into the second glass dish to have lowered the first measurement. The official weight per envelope is 7g. There isn’t a significant difference, so I’ll concede to the official weight as 7g per envelope, but there’s no way it’s 2 1/2 tsp. Even the second envelope was still a little under 2 tsp for volume. So for basic gummy, which uses 4 envelopes: 28g or about 2 1/2 tbsp. I’m very interested in finding out what measurements people get elsewhere for the envelopes. So if you have a moment to spare, check them out and let me know! This entry was posted in Gummy, Products. Bookmark the permalink. Hi Sophia, you'd just do the math using the information above and weigh out what you need on your kitchen scale or measure it out in tsp. So for 3 envelopes, that'd be 21 g (0.74 oz), or about 6 tsp. Thank you so much for doing the work and changing the packets into grams!! You saved me some time tonight! Hi! I just stumbled on your article. I completely agree – I am a fairly experienced home cook, but gelatin has always been a mystery to me. the measurement on the packet mystefied me whenever recipes would call for something other than a "packet" or "envelope" – so I decided to measure like you did, and came up with not exactly 2 tsp (very frustrating!) but I kinda went with the 2 tsp for simplicity sake. I am delving in deeper now upon learning of the health benefits…after just 2 weeks of 1-2 Tablespoons/day an year old rotator cuff injury is feeling SOOOO much better! I'm so excited now I am telling everyone who will stand still to listen. So now, since so many suffer arthritis and/or injuries and want to know more – I must know how much to tell them to take. Since I bought the bulk jar, but many stores only carry the packets, I've been telling friends 2 packets = 1 Tbsp which is more or less correct, since 4 tsp. = 1 Tbsp. but I agree, weighing would probably be the most accurate method to get best results. Uhm…. no. 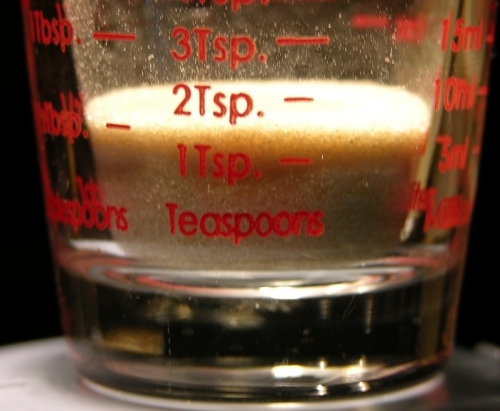 3 tsp is a Tbsp, not 4. That depends on your country. In Australia one tablespoon is twenty mis, or 4 teaspoons. In the US I understand that one tablespoon is 15 mls, or 3 teaspoons. It is something you have to watch when using recipes from another country! Yes you're absolutely right, the Aussie tablespoon is 20 ml and the North American is 15 ml. The UK tablespoon is 17.7 ml. I should amend this piece to make that clear…I've mentioned it elsewhere on the blog in referencing Australian recipes, and I have an Aussie tablespoon from my Australian inlaws precisely for that reason! How many gram for 1 packet ? As mentioned throughout the article above, it's 7g per packet. That depends on what you're doing with it. Your recipe should tell you how much water. gelatine do I use compared to a Large box of jello? Sorry I only saw this now…I'm not 100% how much volume a Jello box makes and I no longer have access to Jello products, but I'd generally go by weight as a rough guide. So if your Jello box is X grams, I'd use that same amount of unflavoured gelatin (keeping in mind that the Jello contains sugar and such as well). I have a 16oz box of Jello how many packs of knox gelatin will I need to make finger jello?